and/or monitor the fitness. 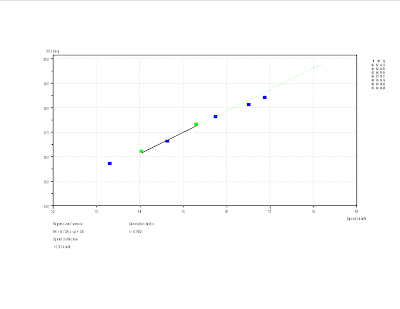 So it was time for a Conconi Test. of a concept that has been around since the 80s. RS800 HRM is the "automatic"Conconi Test. from the Polar SW !!! track for the rain of the night. jumped straight to 1'40"... I need more practice. The Polar RS800sd has an interesting function called "Running Index": basically is kind of indicator of the level of "performance" during a workout, based on the HR and speed. more info on the Polar website. Anyway in the long term it is a useful indicator of the level of fitness, especially looking at the trend, rather than the actual value of a single workout. Well, anyway the chart speaks for itself. At the best of my form (January-March) I was around 77-80 for most of the runs. Now I dropped at 70 (at the best), a value similar to the same period of last year. Last week I did managed 25km in 3 session. I buy into the suggestion of a reader about taking very gradual approach to building up distance. - this time, I guess due to the increase in mileage after the CNY holiday. So it is really negligible occurrence in such a long span of time. Unfortunately I have the right leg that is 1,5cm shorter than the left, and also bow knees. This put most of the stress on the left leg (all the injuries described before were on the left leg). this post is more a kind of self-encouragement, because as a runner I am a bit at the low end of motivation right now. Yesterday I resume running after 15 days of further stops. I really wanted the injury at the leg to get settled once for all and now everything seems OK, even if I would maybe need some more physiotherapy and massage to relax the muscles further. In front of me I have 3 months without races (the HK running season is over because of the heat), temperature already around 30C/90F and the need to restore a good aerobic base after 2 months of poor/no training. So it looks pretty daunting perspective: since I live in China (8 years) I struggled a lot to go through the summer season. I can not stand the heat and humidity. Basically for many years I simply did not run at all for 4 months at least, preferring instead cycling and swimming. Last year I did managed to run maybe 40/50km weekly and it did give much better results once the running season resumed. This year I really want to run around 70/90km weekly during Summer, in order to have a much better starting fitness once I can resume the real training in September/October. 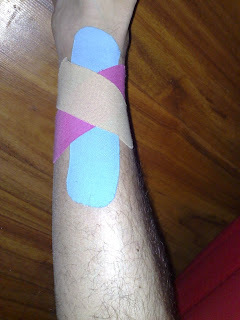 By the way, for the leg injury I got some good benefit from KinesioTaping, practiced by a good physiotherapist in Poland (Dr Andrzej K. in Rybnik). Look at the job done on my leg (called cross taping) (the different colors were only to give some "visual effect"). The tapes are a Japanese stuff produced by Nitto Denko. European website is www.k-active.com with Online sales in preparation. outside is a sunny day, dry, temperature 9C rising to 15C by mid-day. It would be the perfect setting for running, but the Krakow Marathon will not see me at the start this year. Since I arrived in Poland, all my "test runs" gave a negative results: after 10k the pain in the leg comes out again and I can not imagine to run 42k in such conditions. So I gave up and just take the whole holiday as a "DNR" in the log. It is really depressing because last week I thought to be already ok, but evidently incresing the workload was the wrong choice.